Eating out in China can be a different experience from eating out in America. Two of my favorite dishes to eat in Chinese restaurants are Chinese hot pot and barbeque, both of which are make-it-yourself meals. Chinese hot pot is like a fondue pot, but instead of oil or cheese you have a broth. It can be done in an individual pot or in one big pot. Chinese barbeque is done in a small, heavy pot that goes in the middle of your table. Both of these dishes are cooked right at the table. In the hot pot you will have broth or water. Paper-thin meat is usually the first item you will choose. The selection ranges from beef, chicken, lamb or fish. When I have had fish hot pot, we selected the fish we wanted from a pool of live fish. After picking the fish that we wanted, we then went to the room where it would be served By the time the broth was hot the fish arrived ready to go into the pot. Items that go with the meats are mushrooms, spinach, Chinese cabbage, lettuce, eggs, potato and tofu. When the broth is near boiling, it is time to take your thin meat and place it into a small spoon that has several holes in it so that the broth can surround the meat and cook it. It usually takes a minute or two to cook the meat. Each person has a small cup of sesame oil that has been seasoned to taste. Items that can go into the sesame oil are cilantro, finally diced garlic, soy sauce, or seasoned vinegar. After you have had some of the meat, it is time to start adding the vegetables. It is so nice to sit around and enjoy the conversation, while you slowly cook your lunch or dinner. When you are finished the heat can be turned off, and when the broth is cooled it is delicious to eat as a soup. That is my favorite part! When I have had Chinese barbeque, they have brought a round shallow pan with about a quarter of an inch of water in the bottom. I believe this is to keep the table cool. There is a heavy cast iron grill on top of a cast iron pot of very hot coals. When the cast iron was hot enough, the marinated meat (which was also mixed with small onions a little garlic and cilantro) was put onto the oiled pan to cook. It only took about 3 to 5 minutes for the thin marinated slices to cook. 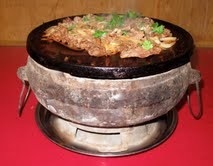 I have also seen them put thin slices of vegetables to cook on the hot surface.